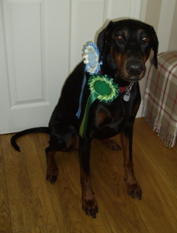 In early October 2009 I took on Flo, a 10-month old Dobermann. As an experienced Dobermann owner I thought I could cope - famous last words! Three years on, we have made fantastic progress. After contemplating Flo would never go beyond my back garden, I can now take her out with confidence. I could never have done it without We Train Any Dog - the Instructors gave me the nerve to go on - in Heather's words "Flo is so worth it". Take your puppy to training as soon as possible - Flo never got the chance, your dog does. Thank you. 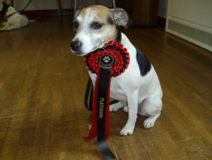 Sam is my five-year old terrier, a rescue dog who came with some challenging behaviours! Going to Heather's dog school for the last 18 months has been a fun and rewarding experience for both of us. Being a feisty little fellow, the mental and physical stimulation he gets from weekly classes have really helped channel his energies in a positive way and he gets to socialise with other dogs too. Sam now has his Basic, Graduate, Advanced and Platinum certificates and rosettes - proof that training works and can be fun at the same time! It's not just Sam who has benefited either - I have learned to be a better owner. An added bonus is that I get to socialise too, with other owners, over a cup of tea! An hour a week well spent! I'm really glad I found We Train Any Dog. We first took Harry and Maud, our border terrorists - sorry, terriers - to Heather's classes four years ago in Leyburn where they won their bronze 'citizenship' awards. We came back to her recently as we were having problems with them barking at other dogs when on the lead. 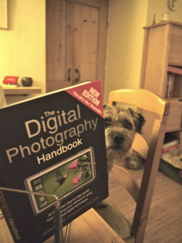 Heather helped us realise that the problem lay with us, not the doggies. She suggested some additional fun training - paw, hand, wait, twist, spin etc - to give them more mental stimulation, and also walking them separately so they didn't gang up on other dogs. They are definitely calmer but we wonder if Harry's been over-stimulated and feels the need for a more demanding hobby. . . When we adopted Barney from Blue Cross in July 2010, he would let us know that he was in charge, to the extent of taking over our settee. Since taking him to training classes run by We Train Any Dog a year ago, he - and we! - have learnt his place in the household. Barney has become very obedient and loving towards us. Thank you, We Train Any Dog! The best bits for me were the quality of the training, small group size, and meeting the other puppy owners. Thanks. I enjoyed doing more advanced tasks and not just sticking to the programme. I have enjoyed the recall work. It's good for the dogs to learn to concentrate in a different environment with other dogs. Thank you. Dear Heather - Thank you for all your help with Oswald; it has been a joy to learn from you. Will stay in touch, all good wishes. I enjoyed tackling unwanted behaviour, the encouragement given by the trainer, and meeting other owners. Thanks. The trainers are second to none. You all do an excellent job! I enjoyed everything on the course. "One of the UK's most experienced dog trainers, Heather Stevens is the driving force behind We Train Any Dog. Her passion for dogs is evident and her enthusiasm contagious. Dog-friendly training at its best!"